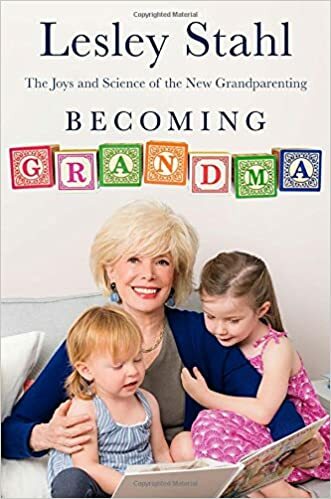 Yesterday morning I caught the beginning of an interview of Leslie Stahl on the CBS morning show - she just released a book; Becoming Grandma: The Joys and Science of the New Grandparenting. Yes, it is about how, as she says; "there is no down-side to being a grandma". Of course this captured my attention, but as my grandsons were arriving, I only caught the beginning of the interview. Today I've spent some time on-line looking at reviews of the book - which I'm happy to share with you . . . AARP is at this link, the Parade review at this link, and the video link for CBS This Morning is at this link. When you have a moment, read a review, watch the interview and consider reading the full book - I loved how she said; "You don't become old when you are a grandma!" and how she ended her interview by telling grandparents who are involved in their grandchildren's lives to get more involved and those who are not involved to get involved, because your grandchildren need you! She is right . . . our grandchildren do need us. And most important of all - not something covered in her book - they need us to point them to Jesus! Yes, they need us for all the reasons in Leslie Stahl's book, but they need us the most to pass on a heritage of faith. I appreciate Becoming Grandma: The Joys and Science of the New Grandparenting and how it shows us people everywhere are becoming more aware of the need grandchildren have for their grandparents to be involved in their lives . . . and how this reminds us of what matters the most . . . pointing our sweet grandchildren to Jesus!